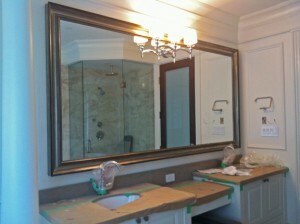 Custom mirror for a custom home by VictorEric Design. Mirrors are more than just an useful everyday appliance that only help with personal grooming or perfecting an outfit. Besides the functional aspect, mirrors take an underestimated, central position in every room and house, an opportunity which is unfortunately too often left aside by simply putting up the blank glass plate itself or with a generic, trivial frame. Just as a mirror reflects your physical image, it is also a reflection of your home. And this is where the question and choice for the right frame become an eminent aspect in enhancing your home. A suitable, professionally designed and built frame for that certain mirror and room will contribute to the perception of the beauty of your home, if chosen correctly. A mirror with a good frame and position becomes a new upgrade and asset to any place. Mirrors and frames can be arranged in very different ways and thus create various sensations. They are an incredibly inventive way to enlarge the appearance of a space. They can be used to break up a wall, sit over a mantelpiece, or dress up a powder room. The possibilities and variations are almost endless. Our expertise, knowledge and experience make us the perfect choice in assisting you in any request. Custom mirrors can be made at any size and framed with almost any style of moulding we carry. It is important to know what kind of wall the mirror will be hung on, so we can advise you correctly on the best way to hang the mirror in the space. We are also happy to help you with details such as whether to have a bevel or not, or how to accommodate things like light fixtures or electrical outlets by cutting holes in the mirror. Contact us or Request a Quote for your next custom made mirror with Framagraphic.